Have you ever thought of growing wonderful climbing vegetables and fruits in an unusual and interesting way? Why not plant a vertical garden! If you prefer to leave your borders free for the more flamboyant flowers, or you're just short of space, growing your vegetables vertically, either on their own, or alongside other climbers, means you have the best of both worlds! And what a joy it is to eat home grown produce. There is nothing quite like it! All my herbs, and a few vegetables, grow right there with my flowers, as most have wonderful features that earn them a place in the garden: sage has a fabulous grey-green leaf that sets off other plants brilliantly, as does golden marjoram which has fabulously zingy, lime-green leaves, and then there's the wonderful flavour of a pea shoot growing over the pergola trellis next to the clematis. Can't resist pinching one of those on my way past! Climbing vegetables can, indeed, be grown intermingling with other plants and flowers, but they can also provide a really wonderful display on their own, too. This type of garden can be planted on a modest scale, or a larger one, depending on how much produce is required and the space available. Many gardeners are 'growing their own' now, and doing it this way can make for a spectacular display and interesting talking point! There are perhaps more plants available than we would at first imagine. Here are a few of the main contenders. And, of course, there are many different types within each category. Some are best planted as seeds, others as small plants. Most will grow outside happily, given a suitable variety and a warm, sunny, south or west-facing aspect. 'Ailsa Graig' has to be one of the best tomato varieties. It is the old fashioned type with a really beautiful flavour, but there are many favourites around. The tall growing varieties are known as 'cordon' varieties, meaning that they are intended to be grown tall, and staked, in order to take up less space. With any of the cordon varieties (the tomato plants you will normally see on sale) you can pinch out the growing tip two leaves above the fourth truss of flowers to give a bushier plant, or support them well around posts, canes or an obelisk, and let them grow tall. They will need a very sunny spot to grow and ripen properly outdoors. Alternatively, buy plants that are intended to be grown outside such as ‘Subarctic Plenty’. This variety will grow up your supports and tolerate a less than perfect summer! What a bonus! For an outdoor, bush tomato that is ideal for growing in a pot or raised bed, go for something like 'Red Alert' which produces reliable trusses of fruit. The cherry tomatoes do very well in hanging baskets and tubs, and 'Gartenperle' is a very pretty trailing type. So, in the case of tomatoes, you have all the bases covered! Hanging vegetables and herbs lend yet another dimension to a vertical garden. When you have a look at the different types of vegetables and their varieties, notice how most of these vegetables need hummus rich soil, and require a reliable supply of water. The thornless blackberry is the most forgiving of all, requiring only partial sun to ripen the fruit. Let's take a look at ideas for a pergola support first. Any pergola can be used to grow climbing vegetables, although there are those that lend themselves to the task. 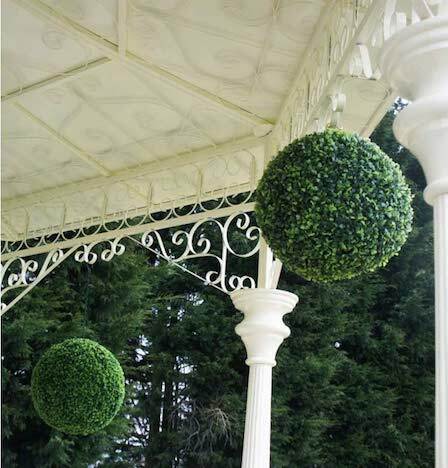 Both metal and wooden pergolas are an ideal way to achieve this. Curved or flat, pointed, or completely round, the rafter style can add a dramatic effect to the whole look. 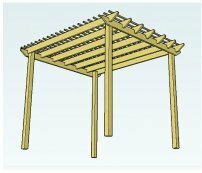 Build your pergola from a manufactured pergola kit or make your own DIY pergola from the free plans. Either way is ideal for growing a vertical garden. Take these three metal pergola kits, for example. Modular sections are joined together to achieve the length required. This is an easy way to plant your vertical garden, and provide a fabulous focal point, too. 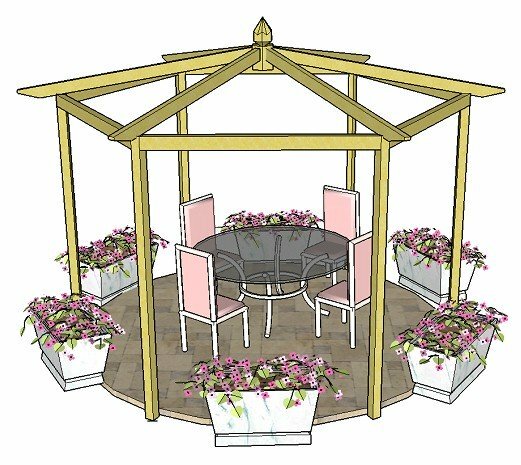 There's 15% off these pergolas (and all items from this seller) with the exclusive voucher code WGWEEK. Submit at checkout. The advantage of a metal pergola is that there is no need to add horizontal supports, as the existing metal supports sit close enough together to ensure that the plants will happily clamber over them. Join together with stong, black plant ties to make a wonderful pergola walkway on a budget. Imagine four, five, or even more of these joined together with fantastic vegetables growing over the top. The only restriction is the size of your garden! Here are some lovely wooden pergola walkways (often called a pergola rose walk) that are great for 'growing your own'. Some have additional support wires provided. Extra supports can be added to those that haven't using strong gavanised wire. Just attach the wires to the pergola posts with metal staples. 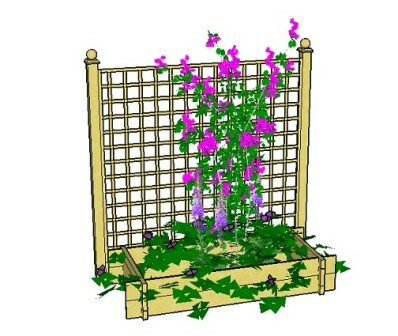 Some climbing vegetables will clamber up any posts, trellis or rafters, such as peas, and certain varieties of runner bean. Others will need a bit of a helping hand, with wires and garden ties. 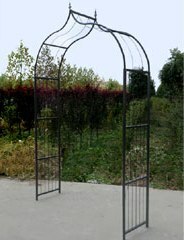 Most styles of pergola are suitable for growing climbing vegetables. Take a look at some pergola kits to get ideas. Get things growing up trellis, canes and obelisks, either planted in the ground, raised beds or large pots. Many types of vegetables can be catered for in this way, and, along with pergolas, pots and hanging baskets, there's a great deal of scope for having a good supply of fresh, seasonal vegetables for much of the year. 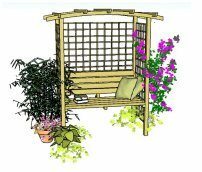 Raised bed and trellis combinations provide height and growing space. Several can be interlinked, or placed at right angles, to make an interesting area. 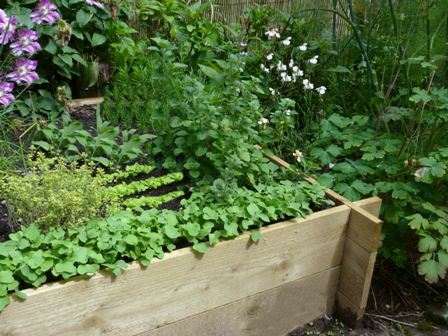 Any size and style of raised bed can be made from the free raised bed plans. Obelisks provide an ideal structure over which to grow climbing vegetables, adding height and elegance. By using a combination of all the various supports and containers, the opportunity for growing different types of fruit and vegetables becomes even greater. Let's see if we can draw up a plan. Here we have a walkway pergola. The pergola posts have been planted with the main climbing vegetables. This is to give them strong support over the structure. They also look good climbing up the posts. 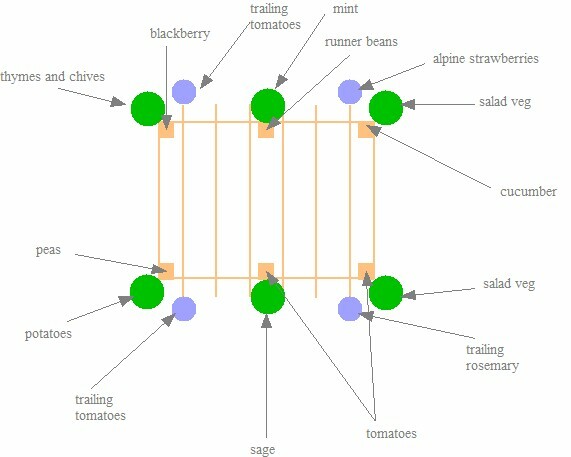 The green circles are pots that stand by the posts. These contain salad and root vegetables, and large and small herbs. The softer, summer herbs will be killed by frost and need a warm sheltered position. Grow pea shoots in tubs too. If you're just looking for a good supply of shoots alone, rather than the full-grown plant, place dried peas from the supermarket in a pot of compost after soaking, and watch your shoots sprout! They are fairly easy to grow and don't require lots of sun. Find out more about growing pea shoots, with pictures and instructions. In the hanging baskets, marked in purple, there are alpine strawberries (useful for both eating and decoration), trailing tomatoes like 'Losetto' and 'Gartenperle', and wonderful trailing rosemary. ...then there are the edible flowers, which look so attractive in salads, soups and drinks: lavender, nasturtium, pea and runner bean flowers (beware of ornamental sweet pea flowers, as they are poisonous), calendula (marigold), violas (heartsease) and pansies, dianthus, cougette flower (very popular on cookery programmes at the moment), rosemary and sage, and more. Do check carefully before eating any flower that it is, indeed, safe to eat! Find out more about edible flowers and edible flower recipes. It seems we could keep adding to our plan, with obelisks at the entranceways and more climbing vegetables between the posts. Just remember to choose plants carefully, feed and water often, and place plants in the sunniest position you can find. I have my own favourites, as you will have yours, too, so plant what takes your fancy, and what you will eat! And remember that these herbs and vegetables are fabulously good for your health. I'm sure your vertical garden will be absolutely fantastic!